Yes, these are the first Winter Olympics with palm trees. Here's a view from outside the Main Press Center looking toward Olympic Park. Yes, these are the first Winter Olympics with palm trees. Here's a view from outside the Main Press Center looking toward Olympic Park. That's my hotel in the foreground. As some of you may notice, it seems to have borrowed its exterior lighting motif from The Naturalist's Notebook's signature 13.8-billion-year, spectrum-color-coded timeline of the universe. Did they know The Naturalist's Notebook was coming? I will hereafter refer to it as the 13.8-Billion-Year Hotel. Twenty-two hours door to door isn’t bad. Not for traveling 5,000 miles and nine time zones, from Super Bowl Boulevard in Manhattan to Olympic Park in Sochi, Russia. My Super Sunday began with a noon cab ride to JFK with a driver from Poland. He was a fan of his country’s medal-caliber ski jumpers and its star cross-country skier, Justyna Kowalczyk. “She has a foot injury…I don’t know how she will do,” he fretted. When I asked whether I might one day be taking a trip like this to Winter Games in his country, specifically to Krakow, which is bidding for the 2022 Olympics, he said that Krakow wasn't prepared for so large an event—but added that it was a beautiful city with old architecture that survived World War II. He seemed happy when I said I hoped to visit it someday, with or without Olympics. That friendly sendoff set the tone for a smooth trip (11 1/2 hours in the air, with a connection in Moscow) and a safe, Seahawks-worthy touchdown in the warmest, southernmost and unlikeliest Winter Olympic host city in history. As my plane neared Sochi in the late afternoon sunshine, the sharp, snowy peaks of the Caucasus Mountains glowed an almost blinding white above a collar of clouds. Those mountains will host a majority of the sports (and not quite half of our Sports Illustrated team) at these Olympics, but I will spend most, if not all, of the Games in the other cluster of venues (skating sports and curling), along the shore of the Black Sea, about half an hour south of Sochi’s downtown. 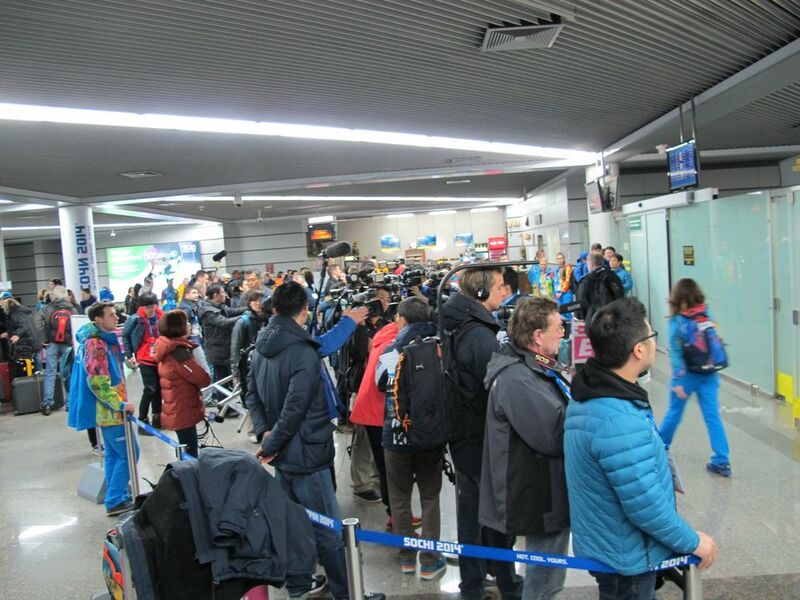 At the Sochi airport, TV crews greeted arriving athletes. In the foreground as I looked out the plane window toward the Caucasus on Sunday were the sea, with a smattering of Naval ships that have arrived to protect the Games, and Sochi, a city of about 400,000 that is Russia’s biggest summer seaside resort. Sochi has been described as the Miami of Russia, but more for its palm trees and orange trees and beaches than its pizzazz. Few Olympic visitors are likely to spend much time exploring it in any case because of the terrorist threats emanating from Dagestan and Chechnya, ethnically restive republics on the other side of the mountains. One of our staff members saw a missile launcher semi-hidden near one of the mountain venues, and the presence of 50,000 soldiers, police and Cossacks underscores how tight the security around here is. A glimpse of the Caucasus Mountains from the press center. 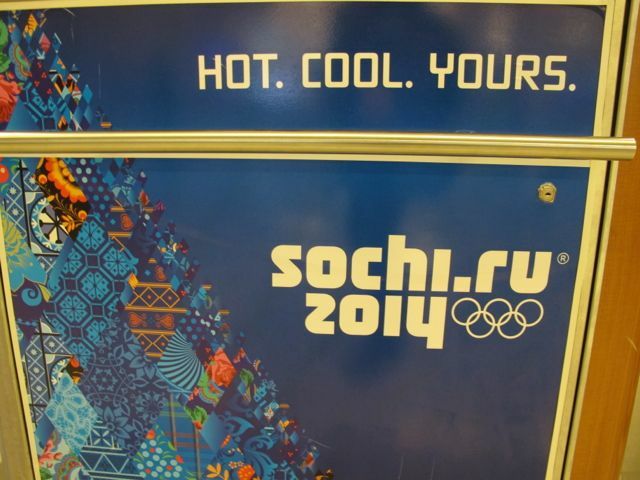 That's the Sochi slogan: Hot. Cool. Yours. That's the Sochi slogan. How hot, you ask? This week's forecast calls for highs in the mid-40s, rising to the low 50s on Friday. How cool, you wonder? About 32 at night here along the Black Sea. My flight from Moscow was filled with journalists and athletes as well as other visitors. The naturalist side of me tries to identify species of Winter Olympian by size and body type, and I think some lugers and perhaps a few ski jumpers and cross-country skiers were on the plane. At the Sochi baggage claim, athletes picked up some very long bags of skis. I went through a processing station to validate my Olympic accreditation, then (after some confusion on the part of the volunteers who are coordinating arrivals) took a media bus to Olympic Park and my hotel. I had to unpack most of my suitcase and backpack to satisfy the security screeners at the entrance to Olympic Park, but that’s part of the drill at these Games. All told, I had to show my passport and accreditation (which is also my Russian visa) at least 14 times during the trip, and went through security screenings three times. All of which was fine by me. My name in Russian, on my Sochi credential. This is kind of cool: my name in Russian, on my Sochi credential. Accreditation check-in at the airport. Those are volunteers, wearing the fruit salad uniforms that are in evidence everywhere. The Main Press Center, where I'll be spending much of my time working for the next three weeks. The color changes constantly, but it's pretty in pink. 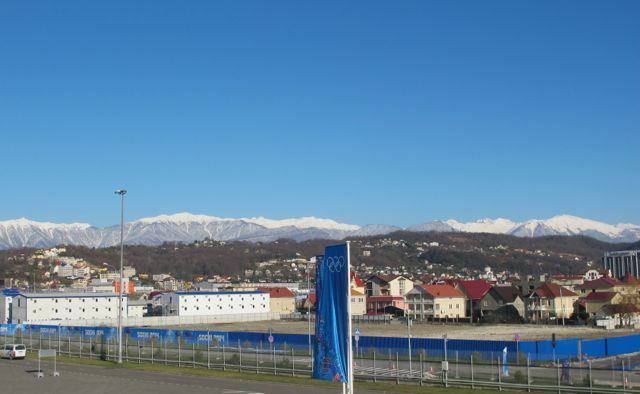 In focusing so much on security, however, Sochi's Olympic organizers have neglected a few other important components of hosting the Games. One is housing for visitors, including not just the media but also athletes' families and staff members from national Olympic committees. Three media hotels in the mountains remain unfinished and others are not fully ready for guests. Other logistical and technical issues have frustrated those media staffers who arrived early to set up computer networks, photo-transmission systems and the like. Some have had to pay cash under the table— "expediting fees"—to get things done. (My Polish cab driver warned me about that, by the way.) At this point Sochi seems to be the least prepared Olympic host city since Athens in terms of basic construction and in training its personnel to deal with the demands of visitors and the press. But it's still early. Stay tuned. I missed seeing the Super Bowl but did see what people Tweeted about it, including some fun football-as-astrophysics observations from the ever enlightening Neil de Grasse Tyson. But my favorite space-related Tweet was this ranking from my Sports Illustrated colleague Steve Rushin: "Top Singer-Planets: 3. Bruno Mars 2. Freddie Mercury 1. Eartha Kitt"